He was a great actor, see? 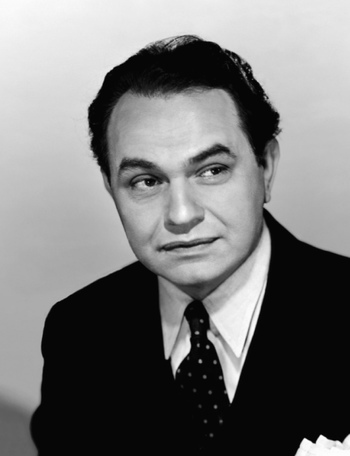 Edward G. Robinson (born Emanuel Goldenberg; December 12, 1893  January 26, 1973), was one of the most famous actors of The Golden Age of Hollywood. Robinson was born in Bucharest, Romania. When he was ten, his family emigrated to the United States to escape anti-Semitic persecution. He began acting on the stage as a teenager, which was when he adopted a much less Jewish-sounding Stage Name. Robinson got a couple of parts in silent movies but hit it big after the transition to talking films led to Hollywood producers looking for fresh talent. His Star-Making Role came in the smash hit gangster film Little Caesar in 1931. Robinson's portrayal of brutal, murderous gangster Rico Bandello wound up typecasting Robinson, a soft-spoken, educated man who could speak seven languages and collected fine art, as a tough guy. His manner of speaking in that film, including the Verbal Tic of ending sentences with "See?" (and to a lesser degree, staring them with "Mmyeh"), also established a stereotype of wiseguy gangster talk that became so iconic that it was used for a gag 80 years later in The Muppets. It was also the inspiration for the voice of Chief Wiggum on The Simpsons. In the 1940s he was able to branch out to some extent from his tough-guy roles, playing such characters as a humble Norwegian immigrant farmer in Our Vines Have Tender Grapes, a pathetic bank clerk manipulated by a prostitute in Scarlet Street, and a shrewd insurance fraud investigator on the heels of Fred MacMurray's murderer in Double Indemnity. He even parodied his earlier gangster image in such comedic films as Larceny, Inc. and A Slight Case of Murder. Robinson was a committed liberal and an anti-Nazi activist. His political activism got him in trouble during The Hollywood Blacklist era and he spent the better part of the 1950s unemployed, but enjoyed a career bounce-back late in life. He died 12 days after finishing his last film role, in Soylent Green. He was given a special Honorary Academy Award, but died of cancer two months before he could receive it.